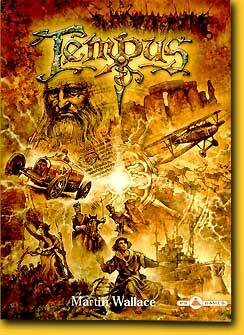 The intriguing cover artwork of the game box invites us to witness the beginning of mankind once again and take an active part in it. We start off with three discs, and our objective is to make it a pretty large family that spreads out over the board and expands, builds cities and manages to catch the plane in time, if possible. After each round is determined who may proceed to the next era with the accompanying privileges. After ten rounds and nine eras the player with the most points wins. Dependant on the amount of players a number of land tiles are put on the board. 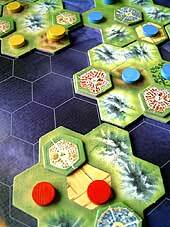 These each consist of seven hexagons, and each hexagon depicts one type of terain: grass, woods, farming land, hills, or mountains. The tiles must be placed connecting with at least one hexside to another tile, whereby lakes can be formed; the water at the edge is considered sea. First, a player places his initial tribe of three discs on the board, one disc per hexagon, and all of them adjacent to each other. After this, a player starts the round with performing his first of three initial actions. Later in the game he may have more actions to do. The actions to be chosen from are: have babies, move, build a city, fight, and have ideas. During the first few eras the possibilities are limited, and movement is only possible to an adjacent hex, and with only one disc. Later on a disc may move two hexes, or even tow discs may move, with a maximum of three discs moving five hexes in the last two eras. Having babies is desirable for expanding and costs an action. Babies only can be produced on grassland, and in the first eras a stacking limit of two must be obeyed. 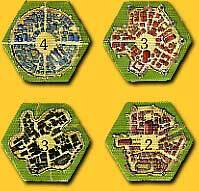 A stack of discs can be traded in for a city with the same number when choosing the action ‘build a city’. Cities may not be build adjacent to each other or on mountains. In the beginning all tribes live together quite peacefully; the baby whining can be heard clearly from the various camps, and one wanders freely through the charming fields. But at a given moment players are confronted with the picket line of the other tribes, and skirmishes are resolved with the action ‘fight’. This goes with the simple rule that the attacker must have more strength than the defender, but both players may play one or more idea cards to influence the outcome of the battle to their advantage. These idea cards have been collected in previous actions, and give all kinds of advantages, from temporarily neglecting the stacking limit, to the additional moving of a discs or extra points in an attack or a defense. At the same time an idea card shows one of the terrain types that coud aide in the battle. All points are added, and the player with more points wins the battle. If this is the attacker, the defender removes all of his dics; the attacker may choose to advance from none to all attacking discs. If the defender declined the attack, the attacker removes one of his attacking discs.